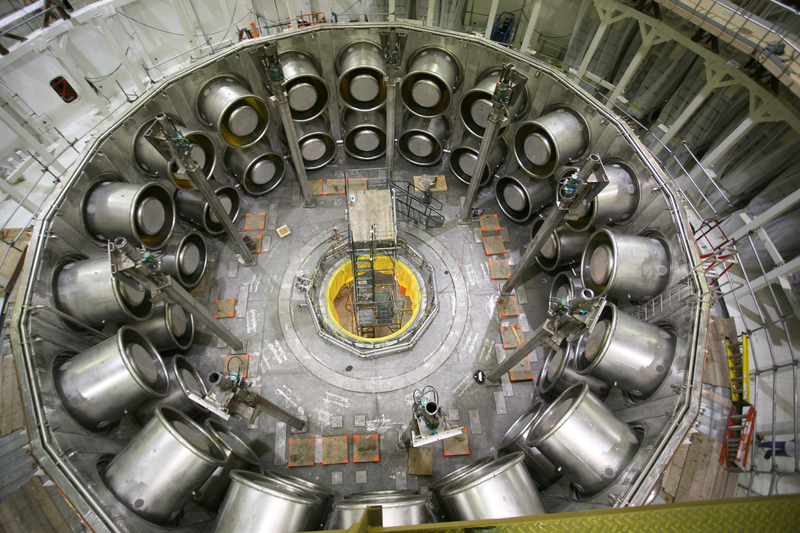 “The Z Machine” sounds like something out of science-fiction, but it’s the largest X-ray generator in the world. Which sounds even more like science-fiction. And if it that’s what it sounds like, it looks like something Michael Bay would cut from a movie’s storyboards for being too awesome to exist with current special effects. Which is why physicists built it with real current effects instead. More lightning than Zeus enraged by Thor rubbing cats on him. 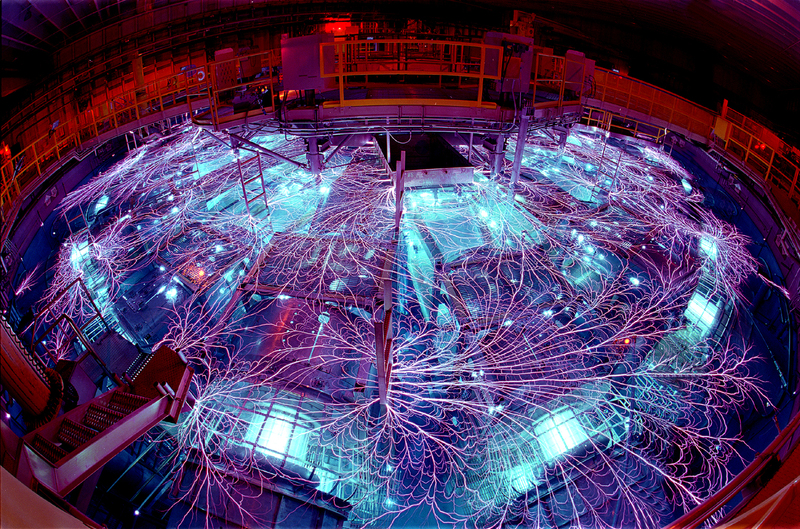 The PBFA-Z (Particle Beam Fusion Accelerator, Z-pinch version) subjects a target to a current of over 20 million amps – more than six hundred simultaneous lightning bolts – and pressures of over 10 million atmospheres. It can reach temperatures of over two billion degrees and melt diamond. Which is the kind of amazing wrong-sounding you get when you adventure into physical realms beyond the calm, damp, and miniscule speck of reality which supports human bodies. You turn diamonds into Dali paintings. 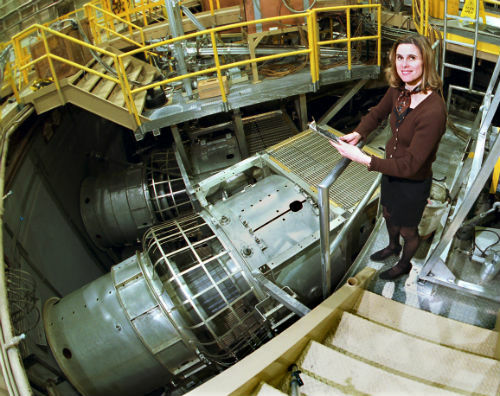 Anyone can create high temperatures by adding Amperes – people with Christmas lights and a deeply misplaced sense of achievement learn that every year – but the Sandia system is piling power against the physical limitations of reality itself. Add enough energy to anything and it isn’t there anymore. The Z Machine is built to pour power into things without melting itself in the process. It’s so far beyond anything we normally understand about machines, it uses water lines to transmit power, and lightning bolts mean it’s working properly. It’s pure plasmapunk, vast energies barely but definitely channeled by our brilliance. Science-fiction is all about people and how they react to revolutionary advances. A common metric for the quality of these stories is how well developed those advances are. Science fact develops them as well as they can be – in fact, they only can be because science develops them – and how we react becomes the science-fiction story. Real science uses the world as a narrative. Society is an analog computer calculating stories in response to the ideas injected by the inventors. And the equipment looks every micrometer the part of a machine to change the world. For more glorious technojoy, behold 9 Badass Spacecraft Landings and 9 Amazing Laser Systems. This entry was posted in SCIENCE and tagged plasmapunk, scienceiseverything, technojoy. Bookmark the permalink.